'Desperately seeking'... 2 bedroom Mt. Pleasant condos! If you're watching the Vancouver real estate market you know there's huge demand for most types of real estate in Vancouver. Kitsilano condos, townhomes and 1/2 duplexes come to mind, along with Mt. Pleasant condos and Vancouver single family homes. One segment of the market that's been REALLY underserved for awhile now is 2 bed condos in Mount Pleasant! Please drop me a line if you're planning to sell your Mt. Pleasant condo. The Real Estate Board of Greater Vancouver (REBGV) reports that residential property sales in Metro Vancouver* reached 3,978 on the Multiple Listing Service® (MLS®) in July 2015. This represents a 30 percent increase compared to the 3,061 sales recorded in July 2014, and a decrease of 9.1 percent compared to June 2015. Kitsilano condo prices up, same as Vancouver real estate market! 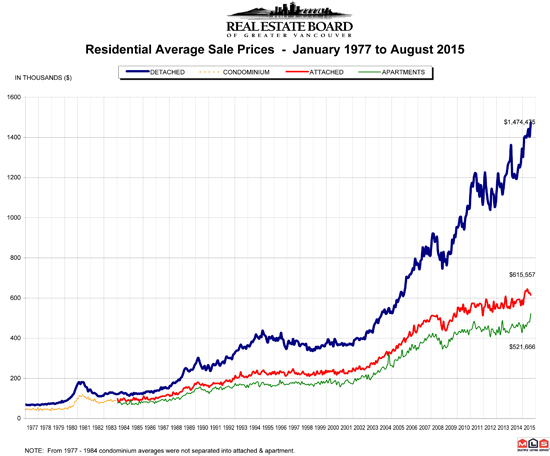 Check out this interactive graph for Kits condo average prices over the past 3 years! Mt. Pleasant condo prices up 7% from last year. VANCOUVER real estate. – July 3, 2015 – Last month was the highest selling June, and the second highest overall monthly total, on record for the Real Estate Board of Greater Vancouver (REBGV). The REBGV reports that residential property sales in Metro Vancouver* reached 4,375 on the Multiple Listing Service® (MLS®) in June 2015. This represents a 28.4 percent increase compared to the 3,406 sales recorded in June 2014, and an increase of 7.9 percent compared to the 4,056 sales in May 2015. Last month’s sales were 29.1 percent above the 10-year sales average for the month. It’s the fourth straight month with over 4,000 sales, which is a first in the REBGV’s history. The previous highest number of residential home sales was 4,434, recorded in May 2005. The MLS® Home Price Index composite benchmark price for all residential properties in Metro Vancouver is currently $694,000. This represents a 10.3 percent increase compared to June 2014. "Conditions today are being driven by low interest rates, a declining supply of detached homes, a growing population, a provincial economy that's outperforming the rest of Canada, pent-up demand from previous years and, perhaps most importantly, the fact that we live in a highlydesirable region," McLeod said. New listings for detached, attached and apartment properties in Metro Vancouver totalled 5,803 in June. 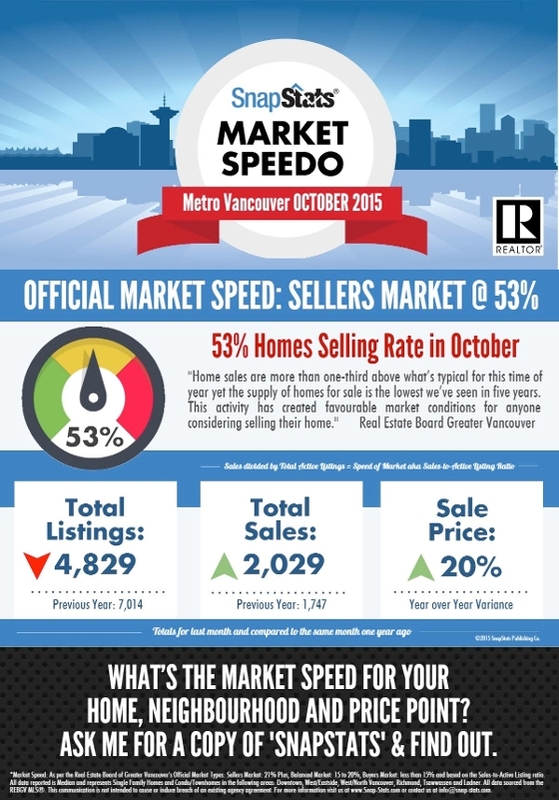 This represents an 8.7 percent increase compared to the 5,339 new listings reported in June 2014. The total number of properties currently listed for sale on the region’s MLS® is 12,181, a 23.9 percent decline compared to June 2014 and a 1.3 percent decline compared to May 2015. This is the lowest active listing total for June since 2006. The sales-to-active-listings ratio in June was 35.9 percent. This is the highest that this ratio has been in Metro Vancouver since June 2006. A seller’s market typically occurs when this ratio exceeds 20 percent for a sustained period of time. Sales of detached properties in June 2015 reached 1,920, an increase of 31.3 percent from the 1,462 detached sales recorded in June 2014, and a 74.2 percent increase from the 1,102 units sold in June 2013. The benchmark price for a detached property in Metro Vancouver increased 14.8 percent from June 2014 to $1,123,900. Sales of apartment properties reached 1,774 in June 2015, an increase of 35.6 percent compared to the 1,308 sales in June 2014, and an increase of 66.1 percent compared to the 1,068 sales in June 2013. The benchmark price of an apartment property increased 5.3 percent from June 2014 to $400,200. Attached property sales in June 2015 totalled 681, an increase of 7.1 percent compared to the 636 sales in June 2014, and a 44.3 percent increase from the 472 attached properties sold in June 2013. The benchmark price of an attached unit increased 7.1 percent between June 2014 and 2015 to $506,900. Kits townhouse prices up, Kits condo prices hold steady. Kitsilano townhome (including Kits 1/2 duplexes) prices are up 7.1% from this time last year while Kits condo prices are stable with just a 1% increase. Prices for both types of Kitsilano real estate are up hugely over the past 10 years - anyone living or buying in the Kits neighbourhood can attest to that! Here's the interactive graph where you can check out pretty much any point in time. 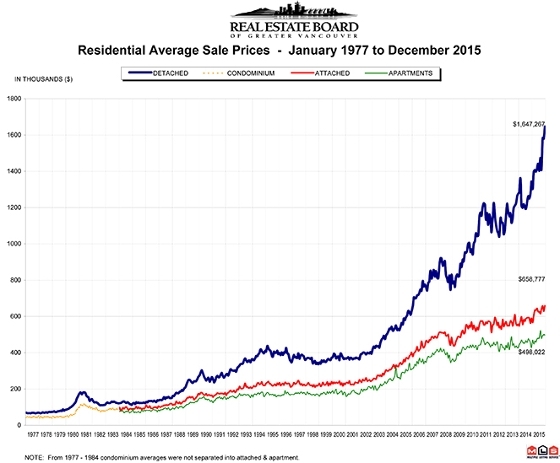 Kitsilano real estate prices up year over year, as expected! Mt. Pleasant real estate prices up for townhouses and condos too. The price increase in the previous post was for all types of Mount Pleasant real estate. If we look at Mt. Pleasant condos and townhouses then the increase in prices year over year for these types of properties is pretty much the same at 4.6% and 4.4% respectively. And pretty darn impressive over 10 years at 84% for Mt. Pleasant condos, and 75% for Mount Pleasant townhomes. Mount Pleasant condo in rain screened building!